Hi Friend! It’s National Letter Writing Month! Hooray! We have many fun things planned for you all month long, but to kick things off, I wanted to first recognize my true passion: HAND LETTERING (literally writing letters! :)) To do so, I am giving away an hour long, private one-on-one video call to one winner to talk all things lettering, give my best tips, answer your questions, and connect with someone who also shares this love. Ever since writing The Complete Book of Chalk Lettering, teaching others how to letter & find their lettering style has brought me so much joy. Scroll down to the bottom of this post to enter! When Lily & Val began almost six years ago, I never dreamed it would become what it has. 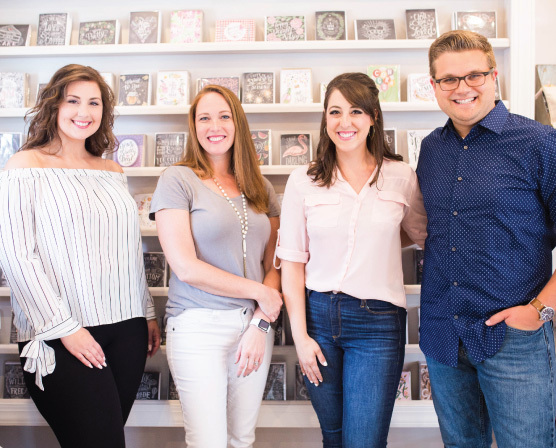 Over the years, the brand has developed into a community who celebrates nostalgia, taking things a bit slower, thoughtfulness, paper over technology, the simple things in life, and of course, hand lettering! This month represents all of those things and for that reason, it’s very near and dear to the L&V team and me. Stay tuned for more surprises and fun this month! Xoxo! Fill out the entry form below. All fields are required to enter. The winner will be announced on April 10th at 12pm EST during a Facebook Live! Like Lily & Val on Facebook so you don’t miss out. (Giveaway is open to everyone 18 and older). It would be such an honor to have an hour to chat with you about lettering!